Air-Compressor-Reviews.net strives to offer the best reviews and information to help you make an informed purchasing decision for your next air compressor. Whether you are a professional contractor and need some serious power or simply need a cheap air compressor for the garage to inflate tires and such, our goal is to provide balanced reviews for all price points. While we review the most popular brands of air compressors, we also want to inform you about the lesser known brands which can sometimes save you a lot of money. Our air compressor reviews are written in a way that will quickly allow you to see the model’s strengths and weaknesses. We use a combination of personal experience, other users experiences, and information from manufacturer’s websites and manuals to compose our reviews. 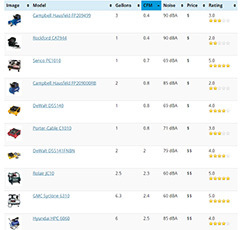 Over time, we will continue to add reviews and information about new models and brands. As always, please contact us with any questions or if you like to see us do a review on a particular model that interests you.